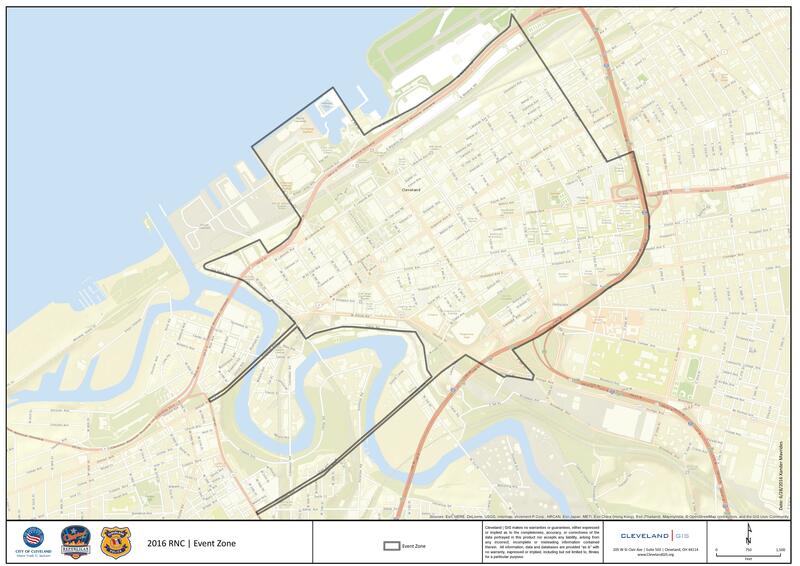 The City of Cleveland would like to remind the general public and media of prohibited items in public access areas for the Republican National Convention from July 17-21st. “Public Access Areas” are any space in the Event Zone, excluding spaces designated as the Secure Zone, that is open to access by the general public, including streets, sidewalks and public grounds. Lumber larger than 2” in width and ¼” thick, including supports for signs. knuckles, nunchucks, mace, iron buckle, axe handle, shovel, or other instrumentality used to cause property or personal damage. Any explosives, explosive device, or incendiary device. Drones and other unmanned aircraft systems. Mace, pepper spray or other chemical irritant. Any projectile launchers, such as water guns and water cannons. regardless of whether the container holds any substance. locks attached to a bicycle. from an oxygen tank to the person. Tents and other shelters, sleeping bags, sleeping pads, mattresses, cots, hammocks, bivy sacks, or stoves. Non-plastic containers, bottles, cans, or thermoses. Grappling hooks, sledgehammers, hammers, and crowbars. Any other item determined by the Chief of Police. normal course of the person’s licensed business or employment and to be used within place of employment. Persons possessing an item listed above when the person resides within the Event Zone and the possession of said item is kept and used within the person’s residence. Law enforcement personnel or other local, state, or federal government employees possessing a prohibited item in the course of their authorized duties. Any licensed medical professional in the performance of their medical duties. It is unlawful for any person, with the intent to obstruct the public’s ability to freely move about on rights-of-way, sidewalks and other areas to which the public has access, to possess or place any tool, object, instrument, or any combination thereof, that is adapted, designed, or intended to be used for obstructing the public’s ability to freely move about on rights-of-way, sidewalks or any other area to which the public has access. This shall include, but is not limited to, the maneuver commonly referred to as the “Sleeping Dragon,” tripods, bipod, pole, any sections of pipe or containers filled with or wrapped in weighted material such as concrete and/or containing handcuffs, chains, carabiners, padlocks, road stars, or other locking devices. It is unlawful for any person to inhibit, for any reason, the movement of emergency equipment on streets, rights-of-way or sidewalks. It is unlawful for any person to place any instrument, tripod, bipod or other pole or object with the intent to obstruct the public’s ability to freely move about on rights-of-way, sidewalks, entrance and exit to private property or any other area to which the public has access. It is unlawful for any person to attach themselves to another person, building, Vehicle, or fixture with the intent to obstruct the public’s ability to freely move about on rights-of-way, sidewalks, entrances and exits to private property, or any other area to which the public has access. Government employees in the performance of their official duties shall be exempt from this section.